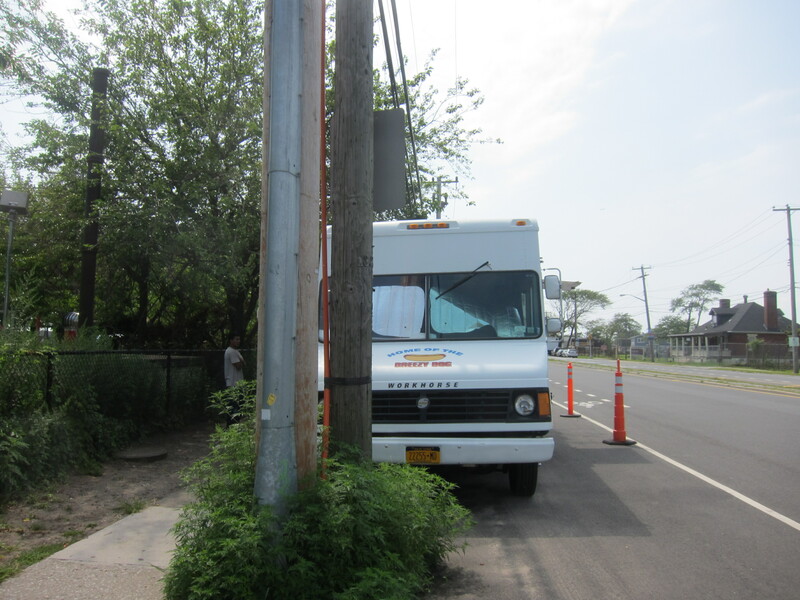 Even though we’d read as much as we could on the whereabouts of this truck, we still weren’t entirely clear where to go once the bus stopped in Breezy Point, New York. 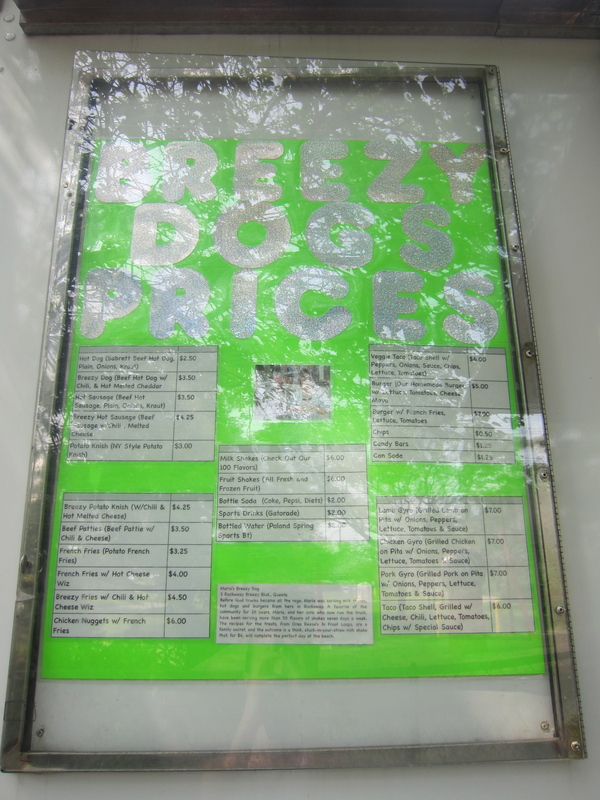 The menu is pretty straightforward — you have a range of hot dogs from $2.50 to $4.25 or various wraps, tacos, knishes and more. 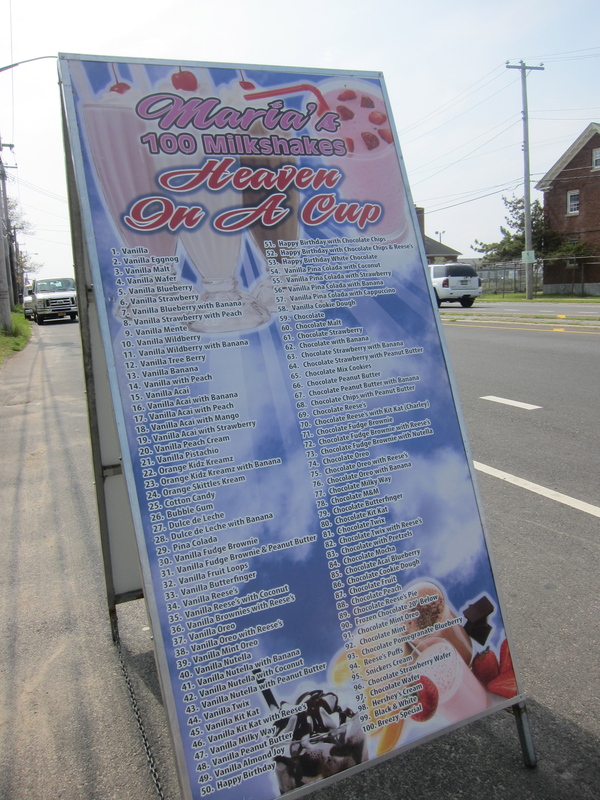 Besides the hot dogs, the big thing here is the milkshakes — 100 flavors, I kid you not. 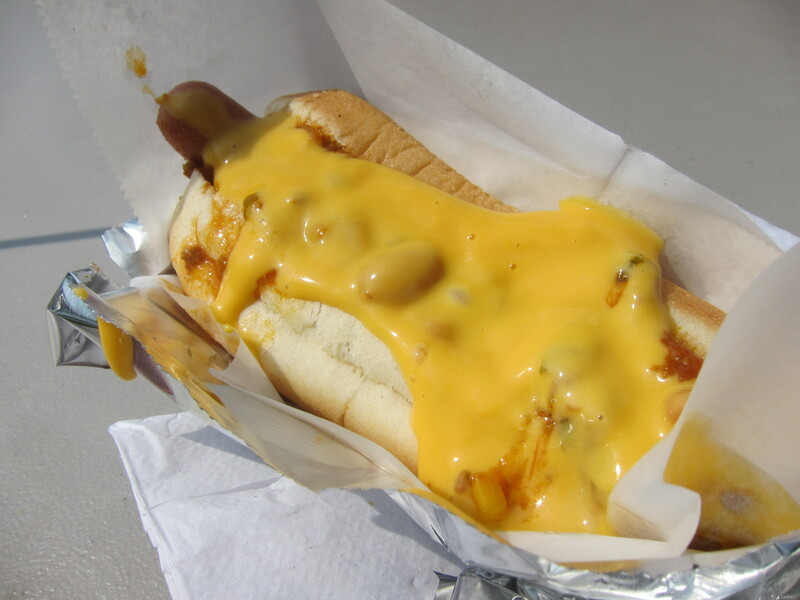 We get a Breezy dog ($3.50) — beef hot dog, topped with melted cheese and chili. 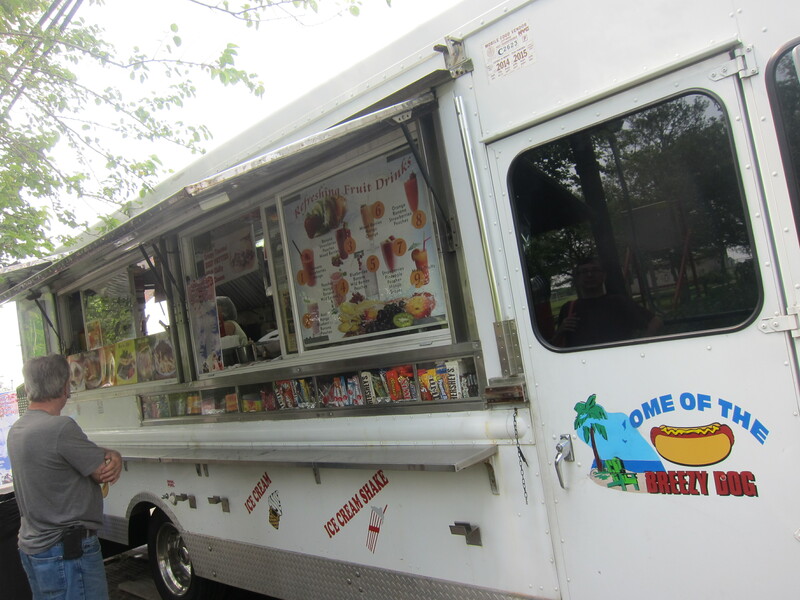 The bun is soft, the hot dog is basic but the overall combination of meat, sweet roll, just a thin layer of chili and a river of runny cheese is delicious, hitting the spot immediately. No dice, alas — they’re out today. 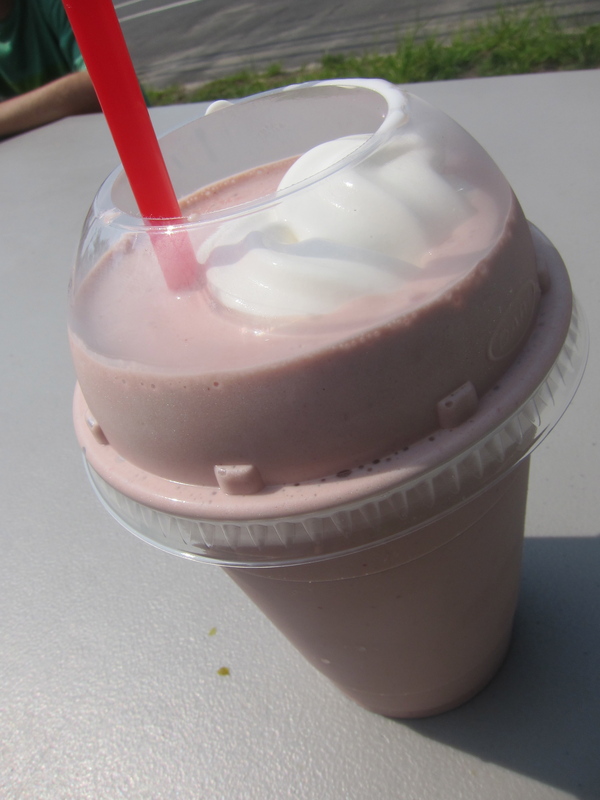 A chocolate-Twix shake sounds just a bit too decadent so chocolate-strawberry it is. And a mind-blowing one at that — just enough chocolate to taste but not so much that it overwhelms the strawberry. The few bits of fresh strawberry we find on our tongues are a pleasant surprise. The boy was right — this is “soooo good.” As they wrap up, they offer sound advice on beach adventuring, too — ignore the signs, go past the barricade and at least get a glimpse of the tip of Fort Tilden beach, which is still closed following 2012’s Hurricane Sandy. “They don’t really check you,” one very seriously volunteers. We watch as they take their last sips, toddle over to their bikes and slowly meander off into the afternoon. A perfect summer day indeed.